Fig. 8.4.1 Based on Newsholme, E.A. & Leech, A.R. Biochemistry for the Medical Sciences. 1983. © John Wiley & Sons Limited with permission. Box 8.5 How much ATP is used in running a marathon? There are several ways this problem might be approached. This is one. At higher intensities, carbohydrate tends to predominate early on, fat becoming more important later as glycogen stores are depleted. As we have seen several times, the amount of glucose present in the circulation and the extracellular fluid is small, and cannot be depleted without harmful effects. Therefore, the carbohydrate used during endurance exercise comes from glycogen stores, both in exercising skeletal muscle and in the liver. In principle, it might also come from gluconeogenesis: exercising muscles always produce some lactic acid, even in aerobic exercise, and this should be a good substrate for hepatic gluconeo-genesis. 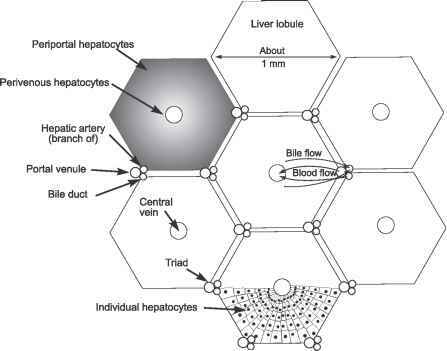 In fact, gluconeogenesis seems to be restricted during exercise, perhaps because blood flow to the liver is restricted as blood is diverted to other organs and tissues (mainly, as discussed below, skeletal muscle). The use of different fuels at different intensities of exercise is illustrated in Fig. 8.9. Fig. 8.9 Utilisation of different fuels during exercise at two intensities. The intensities of exercise are judged by oxygen consumption, in relation to the maximal rate of oxygen consumption for the individual (VO2max). Panel (a) shows exercise at 65% VO2max; 2 h at 65% VO2max is relatively heavy exercise. (An elite marathon runner would maintain about 85% of VO2max for 2 h 10 min.) Panel (b) shows exercise at 25% VO2max; 2 h at 25% VO2max is relatively light. 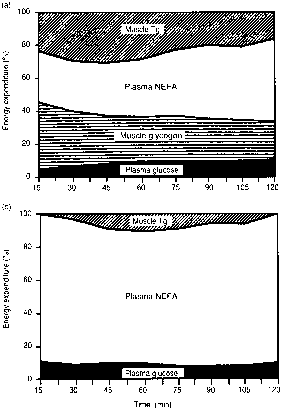 The figure shows the relative contribution to energy expenditure (total energy expenditure is taken in each case to be 100%, although it is 65/25 or 2.6 times greater in the top panel). The data were obtained by a combination of indirect calorimetry and use of isotopic tracers to measure the whole-body turnover of glucose, glycerol and fatty acids. Based on Romijn, J.A., Coyle, E.F., Sidossis, L.S. et al. (1993) Regulation of endogenous fat and carbohydrate metabolism in relation to exercise intensity and duration. Am J Physiol 265: E380-E391. With permission of the American Physiological Society. for exercise should be generated by oxidation of fat. We have far more energy stored as fat than as carbohydrate, and there is not the same need to 'preserve' it for the functioning of organs such as the brain. In addition, fat is, as we have seen, a very 'light' way of storing a lot of energy. However, it appears from a number of studies that oxidation of fat can only support around 60% of the maximal aerobic power output. The evidence is briefly this. In ultra-endurance athletes (e.g. 24-hour runners), power output drops with time to about 50% of maximal aerobic power, at about the same time as the glycogen stores are depleted. In less well-trained subjects, it also appears that fat oxidation contributes a maximum of about 60% of muscle oxygen consumption. Therefore, the maintenance of maximal aerobic power output requires that carbohydrate is oxidised as well as fat. Since this carbohydrate comes from the glycogen stores, the time for which maximal aerobic power can be sustained depends upon the amount of glycogen stored initially. Depletion of the glycogen stores leads to a sudden feeling of fatigue, described by marathon runners as 'hitting the wall'. The Swedish physician Jonas Bergstrom and a Swedish physiologist, Eric Hultman, showed this directly during the 1960s. They measured the content of glycogen in small samples (biopsies) of muscle, taken with a special needle, in a group of athletes who were each studied on two or three occasions, after consuming different diets. The different diets (mixed diet; low-carbohydrate diet; high-carbohydrate diet) produced different initial concentrations of muscle glycogen, and it was found that the 'time to exhaustion' when working at 75% of maximal aerobic power correlated with the initial muscle glycogen concentration (Fig. 8.10). This observation has led to the development of methods for boosting the muscle glycogen stores for endurance runners (glycogen loading). Having looked at the overall pattern of fuel utilisation during aerobic exercise, we shall now consider in more detail the regulation of the utilisation of individual fuels, and how the delivery of energy is regulated by the hormonal and nervous systems. 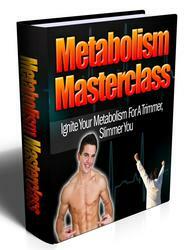 Are You Sick And Tired Of All The Fat-Burning Tricks And Trends That Just Don’t Deliver? Well, Get Set To Discover The Easy, Safe, Fast, And Permanent Way To Mega-Charge Your Metabolism And Lose Excess Fat Once And For All! This Weight Blasting Method Is Easy AND Natural… And Will Give You The Hot Body And Killer Energy Levels You’ve Been Dreaming Of.